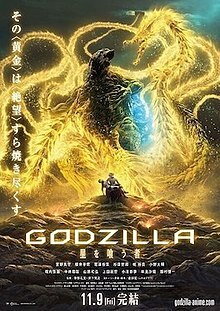 I finally got a chance to view the third and last installment of the Godzilla anime trilogy this weekend. The Godzilla anime series hasn't had the most kind critical response, and the first two installments I did enjoy. I'm not making any apologies. They were slow, weird, and the monsters involvement was disappointing. You had an outright cartoon Godzilla movie and Godzilla was hardly more than occasional background scenery. That being said, I did enjoy those two. I found them entertaining despite the prior complaints. This one, not so much. I found this one to be extremely long winded, too weird (there's a point where weirdness stops being acceptable and just doesn't make sense), and the monsters were completely misused. I usually try to balance the line on spoilers. I feel there's a time where it's considerate of others and a time where others need to get off the pot. I'm going to try to be considerate as I can, but give those who haven't seen it yet fair warning. I try not to get this way about things like movies. It's not important and really doesn't affect a real life. Though when you pay good money for something (life a Netflix subscription, it aint free ya'll) you don't have to accept everything and have every right to be unhappy. You can be a fan of something and be critical at the same time. Of course there's a line between being critical and being a whiny nerd. I'll try my best to stay in the first category for my own sense of self. In a movie where the monsters could have had the most amazing fight possible due to being 100% animated, they're hardly featured and are practically a gif. The plot is complete nonsense that doesn't even try to make sense. The plot of the first two was reaching, but I could still enjoy what they were trying to tell me. I honestly was just waiting for this to be over. Fortunately, the movie wasn't too long as though the creators wanted to get it over also. I was utterly disappointed in this movie and even though the last two were hardly amazing, felt like this would be ok at least. Fortunately Godzilla 2 is coming soon to hopefully wash the bad taste of this out of my mouth.